The Big City Slider Station, the Mini Burger Sensation, is the mini burger sensation that is sweeping the nation. And now you can cook those restaurant mini burgers that everyone loves right at home. 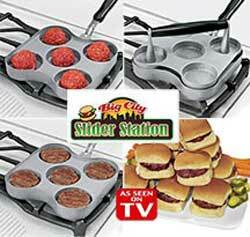 Just scoop, press and cook on any stove in just minutes you´ll have 5 mouthwatering sliders! Made of high grade aluminum the unique grill cooks both sides oat once so you never have to flip them. Make healthy turkey, chicken or veggie sliders. Great for egg sandwiches.